I am very fortunate to have my father-in-law available to babysit for me during the day. Since his retirement he's had the chance to spend time with Mac on more than one occasion. One such regular date they have is normally every second Wednesday, when I go get a massage. Wednesday happens to be the day that my FIL meets up with a bunch of ROMEO's (thanks for the term, Janelle) so he takes Mac with him and they spend time together, just the boys. So after a very well-needed massage (don't judge - growing a baby is hard work!) I arrived home in time to feed Mac lunch and then throw supper in the oven (slow cooked ribs... mmm). As soon as I finished, I told Mac to get ready for bed. And that's when disaster struck. Mac has four (yes, four) stuffed giraffe toys. They are all identical. It started out as two - one for sleeping and one "just-in-case" backup. But then I thought I should get one to keep in the car too, so that on trips he has his comfort as well. Somehow, we ended up with four. He loves each one, but there's one in particular that is his favourite. He calls it his "best one". It is the rattiest of the bunch, the nice big plastic eyes are scratched and scuffed, no matter how many times I wash it, it has a "smell". The term I use for it is "loved". It's the most "loved" giraffe. He can't sleep without it. He can make due without any one of the other three, but that one HAS to be there. So imagine my (and Mac's) dismay when, upon getting ready for nap time, we arrived at the realization that his best one was no where to be found. Not under the couch, in the microwave (yes, that has happened), in the tub, in the dryer, under the bed or in the closet. Not buried under his pillow or hiding in his sheets. NOWHERE. *Insert crappy feeling of dread in the pit of my stomach here*. Needless to say, all the relaxing, headache removing benefits of my massage flew right out the window. We searched high and low and I stayed in denial as long as I possibly could but eventually had to face the fact that Giraffe was not in the house. So I phoned my FIL and asked if they had taken the giraffe with them when they had gone out and to my dismay they had. So I kindly asked him to go out and look in his truck because we needed it. Like now. And that's when he told me that he thought maybe they had left it at Tim Hortons. *stomach sinks into socks*. I was also starting to think evil thoughts. This is the part where pregnancy hormones get blamed for my crazy train of thought. Because I was thinking My poor kid already lost his dog whom he still asks for and still cries and tells me he misses (true story - talk about heart breaking) and now I'm going to have to explain to him that his comfort toy, his precious and loved giraffe is also gone. Because there's no way they kept a ratty old giraffe toy. I'm going to have to kill my FIL. But I guess pregnancy hormones haven't completely taken over my brain because a part of my rationally thinking self way buried deep inside me said Just try calling the Tim Hortons. Maybe someone there has a kid and knows how devastating losing a toy is. So I called. With Mac sitting rightbesideme and looking up at me with tear filled eyes asking "My giraffe is at my Tim Hortons?" The lady who answered the phone seemed a little taken aback when I told her I had a weird questions. I got halfway through a sentence that sounded something like "My son was there today with his soon to be dead grandfather and I was wondering if maybe you found a stuffed -"
"We have his little giraffe." Five words that made everything OK. The sun shone. Birds sang. The pounding in my head lessened a little. 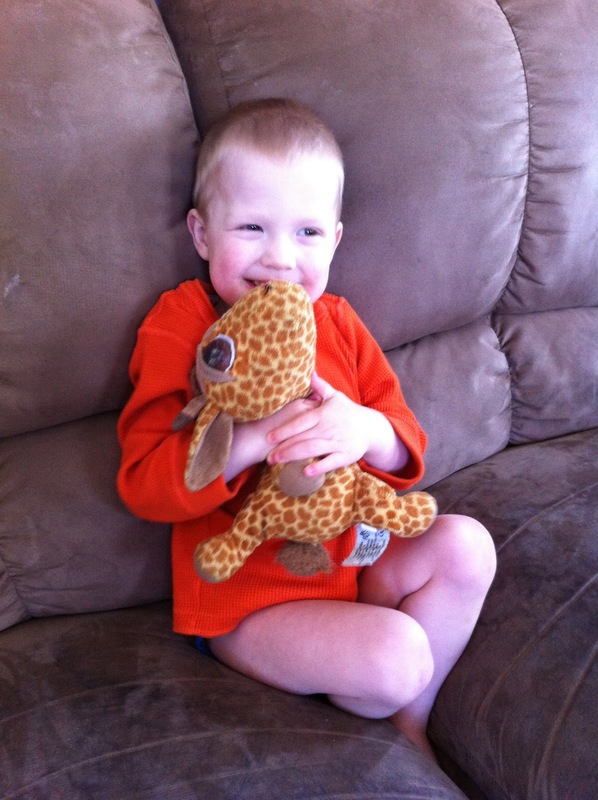 "We found the giraffe right after he left and knew it was his so we kept it. We figured a Dad or Grandpa was going to get in big trouble and be sent back for it." I already believe in angels, but I had never talked to one on the phone. I said thank you VERY much and told her she just made one little boy very happy. And then I hung up the phone and told Mac that giraffe was at Tim Hortons and he would be home soon. Here is Mac and his giraffe happily reunited. And mommy needs an other massage. haha it must be pregnancy hormone day because that picture just made me cry. <3 so glad everything turned out alright!